Tatiana: The mechanism is… Oh James, James… Will you make love to me all the time in England? James Bond: Pardon me, do you have a match? Kerim’s Chauffeur: I use a lighter. Kerim’s Chauffeur: Until they go wrong. Donald “Red” Grant: Is any of the opposition around? James Bond: Not in any condition to be worried about. James Bond: Yes, she had her kicks. Tatiana: [removes ring and hands it to Bond] Here you are. In case you ever need it again. James Bond: Oh, yes. All government property has to be accounted for. But as I said before, we won’t always be working on the company’s time. Will we? Tatiana: James, behave yourself. We are being filmed. James Bond: Oh, not again. James Bond: He was right, you know. James Bond: I’ll show you. James Bond: That must have been a pretty sick collection of minds to dream up a plan like that. James Bond: Tell me, which lunatic asylum did they get you out of? Donald ‘Red’ Grant: [angered] Don’t make it tougher on yourself, Mr. Bond! Donald ‘Red’ Grant: My orders are to kill you and deliver the Lektor. How I do it is my business. It’ll be slow and painful. James Bond: I’d say one of their aircraft is missing. James Bond: Your clock, is it correct? James Bond: Excuse me, you did say your clock was correct? James Bond: How about a cigarette? Donald ‘Red’ Grant: Not a chance. James Bond: I’ll pay for it. Donald ‘Red’ Grant: What with? James Bond: Fifty gold sovereigns. Kerim Bey: [translating] The women will fight until one of them is dead or surrenders. The winner will marry the man they both love, the loser will be cast out of the tribe, never to return. If both quit, the elders of the tribe will then decide who will marry the chief’s son. James Bond: Yes, I think I got it without the subtitles. Man in a Punt: Great sport, this! Woman in a Punt: What? Man in a Punt: I said, it’s great sport, this punting! James Bond: I couldn’t agree with him more. Sylvia Trench: Mmm, I may even give up golf for it. James Bond: Well… who won? Kerim Bey: I had visitors. Limpet mine on the wall outside – timed to catch me at my desk. But by good fortune, I was relaxing on the settee for a few moments. The girl left in hysterics. James Bond: Found your technique too violent? 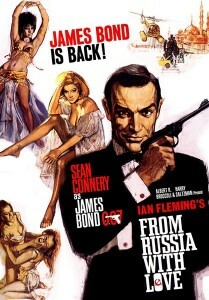 James Bond: There’s a saying in England: Where there’s smoke, there’s fire. Tatiana: [trying on dresses] I will wear this one in Picadilly. James Bond: You won’t. They’ve just passed some new laws there. James Bond: She should have kept her mouth shut. James Bond: [in atypical self-effacement] Suppose when she meets me in the flesh I-I don’t come up to expectations? M: Just see that you do. James Bond: I hope you’re not… disappointed. Tatiana: I will tell you… in the morning. James Bond: You’re one of the most beautiful girls I’ve ever seen. Tatiana: Thank you, but I think my mouth is too big. James Bond: No, it’s the right size… for me, that is. Tatiana: But, there are some English customs that are going to be changed. James Bond: But of course darling. Donald “Red” Grant: We were keeping you alive until you could get us the Lektor. James Bond: So, you had me deliver it on a silver plate? That’s brilliant. Go on, I’m fascinated. Donald “Red” Grant: Now that we’ve got it, you and the girl are expendable… from here onto Trieste. James Bond: The girl? Isn’t she working for SPECTRE too? Donald “Red” Grant: No. She thinks she’s doing it all for Mother Russia. She takes her orders from Colonel Klebb. And so do I.
James Bond: Rosa Klebb? But Colonel Rosa Klebb is a Russian, head of operations for SMERSH. Donald “Red” Grant: Correction: was. Klebb works for SPECTRE now. The girl doesn’t know that. James Bond: But why kill her? Donald “Red” Grant: Orders. That’s only half of it, old man. Donald “Red” Grant: Here’s a roll of film. She’ll have this in her handbag. And on you they’ll find this letter. It’s from her, threatening to give the film to the press unless you marry her for helping you steal the Lektor. James Bond: [confused] What film? Donald “Red” Grant: [sneers] Taken in the bridal suite at your hotel. Something else the girl didn’t know about… or you. Tatiana: I think my mouth is too big. James Bond: I think it’s a very lovely mouth. It’s just the right size – for me anyway! Thank you for your interest in Sean Connery and From Russia With Love.